Leicester-Shire & Rutland Sport - How do we deliver? Home » About Us » How do we deliver? Getting more people to take part in physical activity and sport. Improving our citizen's physical and mental well-being. Developing our paid and unpaid workforce. Creating a strong voice for physical activity and sport. Building a physical activity and sport environment that is safe, fair and customer focused. We want to be the most active place in England, building a healthy and vibrant future for our communities. If we achieve this, we will have been able to contribute to, transforming physical and mental wellbeing outcomes in the sub-region, supporting a stronger economy, and helping individuals and communities to achieve their potential in life. 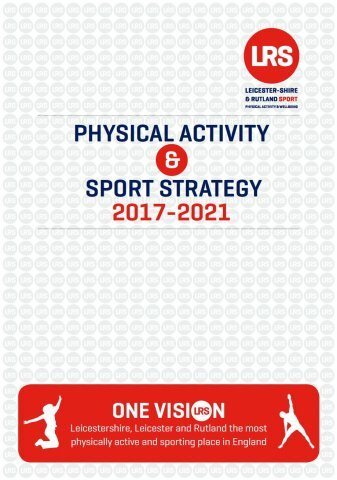 Despite the compelling evidence of the benefits not enough people across Leicestershire, Leicester and Rutland have developed a sustainable physical activity and sport habit. Sport & Physical Activity in Partnership. Welcome to our 2017-18 LRS Annual Review. The document also tells the story of just some of the work undertaken by our local authority, school, voluntary and community partners. The case studies throughout the document are truly inspiring, please take a moment to read them. We are pleased to announce that LRS has achieved a "Very Good" rating in our 2018 Quest Assessment. The external assessment was commissioned by Sport England and is designed to measure the organisational effectiveness of a County Sport Partnership and its ability to deliver a wide range of strategic outputs. 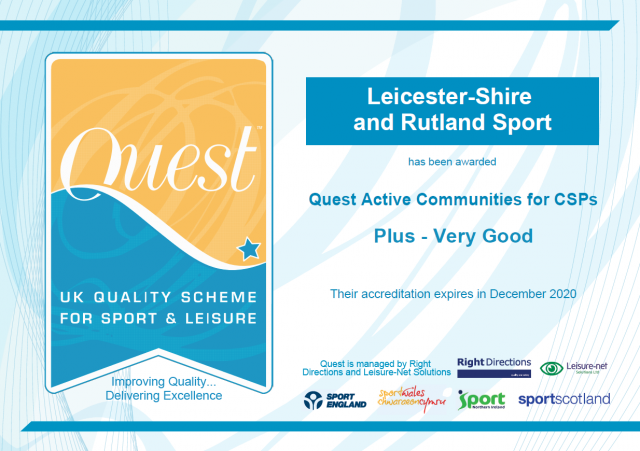 Quest is the sport and leisure industry's leading quality assurance scheme. We were externally assessed across 8 core areas of business including Leadership, Partnerships and Brokering, Contribution to Health and Wellbeing and Engaging with Older People. LRS were rated "Very Good" for 7 out of 8 modules with some aspects of our work to get the Inactive more Active being rated as excellent. The Quest report highlighted a range of strengths and commented that staff are well respected and trusted in their networks, that there is strong evidence of collaborative working and that LRS has improvement and innovation at the forefront of their mind, striving to be the best they can be. "This is a very positive outcome to what was a challenging process and real recognition for a job well done by our team and Board. However, we know there are areas where we can develop further and we will be working hard this year to improve the services that we offer".